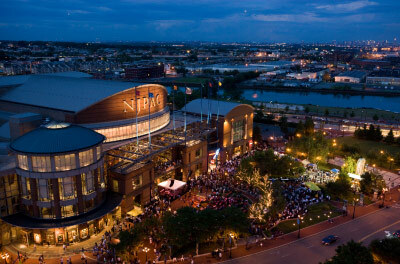 Named the World's Greatest Concert Hall by New York Times music critic Hans Fratel, the New Jersey Performing Arts Center "NJPAC" is one of the top ten largest performing arts centers in the United States. Located in Downtown Newark, NJPAC is a world-class community-based cultural venue that showcases artists of national and international acclaim. Renowned artists who have performed at NJPAC include Alicia Keys, Bette Midler, Britney Spears, Bob Dylan, Sting, Paul Simon, and more! NJPAC is also home to the New Jersey Symphony. In addition to its famous concert hall, NJPAC offers a variety of community programs, such as its Arts Education program and a free summer concert series which draws over 3,000 visitors to the Center each Thursday. Discount parking for NJPAC is available at the following parking locations. Click 'Coupon' next to a location address to print your discount parking coupon (required to receive the special rates) or click the location address to see more information about that parking location. NJPAC is in Military Park and offers waterfront views of the Passaic River. It is also nearby the Rutgers Business School, New Jersey Institute of Technology, Seton Hall University School of Law, Prudential Center, and Riverfront Stadium which serves as home to the Newark Bears.